Although this style is currently sold out, we do have others available .. please ask. Variety of leatherette styles to silk and satin covered books .. everything for your personal style! Clearance priced -- while they last! Don't wait to order yours! Reg. $29.95, now only $15.00! White leatherette style bound guest book features room for hundreds of guests to give you their autograph on your special day! 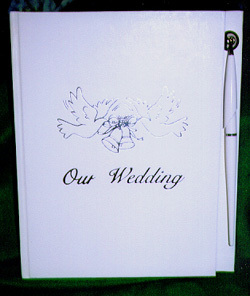 Cover features two doves and intertwined wedding bell design. "Our Wedding" inscription offered in gold or silver on the white background. Attached pen is mounted on the back cover of the guest book, making it always handy as your book is passed around to guests. Measures 8" x 9.5"; gift-boxed.